I admit I struggle with keeping my house clean in the spring and summer because all I want to do is go outside. 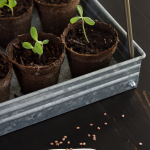 Outside projects, gardening, playing with my kids, hiking, etc. So if I am going to get deep cleaning done, I’m better off doing it when the weather is less than ideal. I usually do my “spring cleaning” in January or February when I am bored to tears from being cooped up. 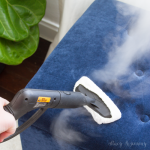 My favorite tool to help with the process is my SteamMachine. 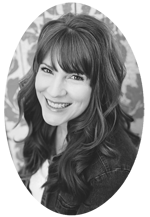 My HomeRight post this month is all about decluttering and cleaning your home. This winter I started with my kitchen. In fact, I posted a video of my son using it to clean the oven on instagram stories and so many of you were impressed. I don’t think I have ever gotten that many messages before! Another place in the kitchen I tackled was the inside of my lazy susans. 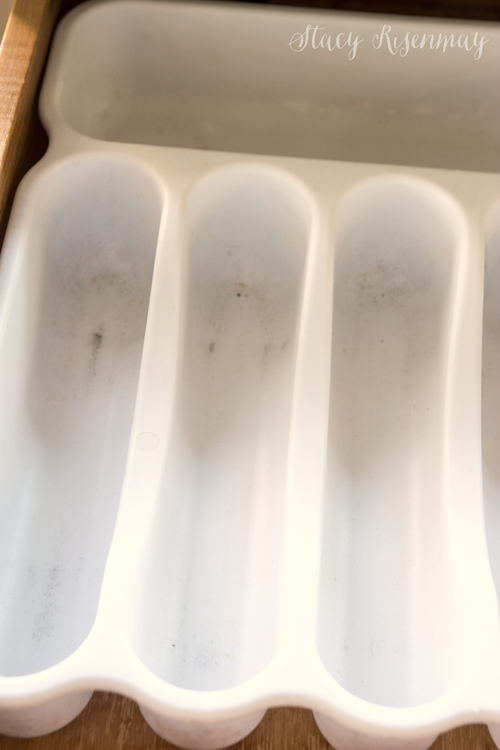 They have a ribbed texture on the plastic trays and before I had the SteamMachine I could never get it 100% clean. I use the the scrub brush tip and it works like a charm! When I was done, I was really picky about what went back in. I made sure all the tupperware had matches and any left over lids (why is it always the lids?) got chucked. I found I had too many medium sized bowls. Many of them I hardly use at all. They went to the basement to the yard sale pile. I thinned the herd so to speak with all the cabinets. My cabinets were here when we moved in so I don’t know how old they are. After being wiped out many times over the years, the inside of the cabinets and drawers are all chippy and ugly. I decided to wipe them out with a rag and then add some cute contact paper. 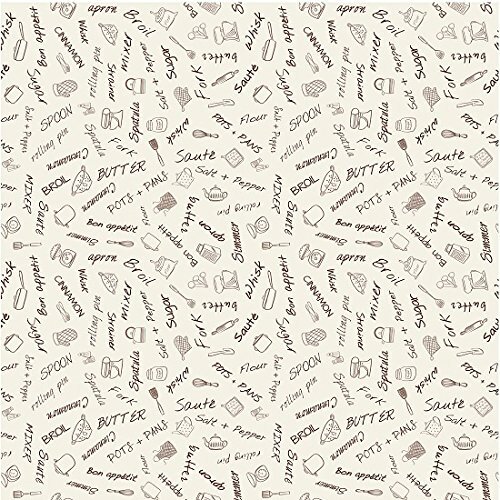 How perfect is this contact paper? I found it on Amazon (affiliate link) and I absolutely love it. I decided to have our everyday silverware in the drawer and our other silverware in a box in the pantry. That way our drawer isn’t as crammed full and messy looking. HomeRight is giving away one SteamMachine and one of their accessory bags! I was always losing the accessories that don’t fit in the compartment on the SteamMachine. I didn’t really have a good place to store them. Now I hang the bag in my laundry room and I always know where they are. Must be 18 years or older to enter and a resident of the United States. The giveaway will run from January 27, 2018 until February 2, 2018. The winner will be picked via random.org and will be notified by email. The winner will have 48 hours to respond or a new winner will be chosen. The company, HomeRight, will be responsible for shipping the prize. This post was sponsored by HomeRight and all opinions and ideas are 100% my own. I do a little nesting when pregnant, but it seems after is when I get my drive to declutter and clean. Although it’s also a busier time. So lately I’ve tackled quite a few clutter spots. We’re decluttering the master right now because we’re finally repainting and spiffing it up. I really need to declutter and clean my entire house – the holidays did me in. 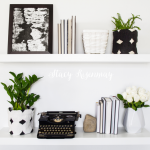 I’m in the process of decluttering as well…so refreshing! I need to declutter our guest bedroom. We live in a small patio home and it has become our catch all space for everything. Thanks for the chance to win such an amazing tool. My wardrobe and bookshelves need a good declutter! I need to declutter my kitchen. I’ve got to many dishes and to many places where it needs steam to get it really clean. I also have grout on my bathroom tiles that could use some deep cleaning. Decluttering is so freeing but also so panic inducing. What if I need that thing, I haven’t used in who knows when, that I sold/gave/threw away? I bet the steamer would do wonders for the trim boards in every room of my house! I feel like I can never really get them clean. I have this sitting on my Amazon wishlist. I need to detail my van and declutter my craft room. I would LOVE to own one of these machines! I need to declutter my closet, it’s been a hot minute since I’ve been through our clothes. Thank You gor the chance! I’m saving to buy my first house and I need to declutter drawers and cupboards like crazy so I can start fresh and organized in my new home. Being a renter until then means everything needs to be steam cleaned! I need to declutter because I let things pile up, plus we have much more than we need. I need to declutter my whole kitchen. Thanks for the chance to win the SteamMachine! Oh my! I NEED this machine!!! Time and motivation! That’s what I need to declutter. Oh, and that steam machine! My sewing/office area needs serious help! I need to declutter the kitchen. 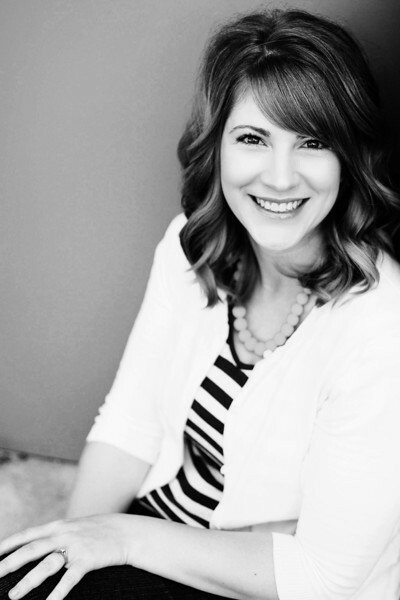 What I need to declutter…. Hmm… Motivation!!!? I need to declutter my bedroom closet. Love this post! This time of the year I’m always looking for ways to declutter and lately I’ve been obsessed with the clear acrylic containers! I have a whole craft room that needs to be decluttered! I have way too much at could use a good cleaning and so much that could go to a home that would use it! It would be a new lease on life! My house is screaming for a declutter party! My sisters and I do a F.L.E.P. ( family labor exchange program) multiple times a year at each other’s homes. It’s a great way to hang out, get some chores done and drink some wine. 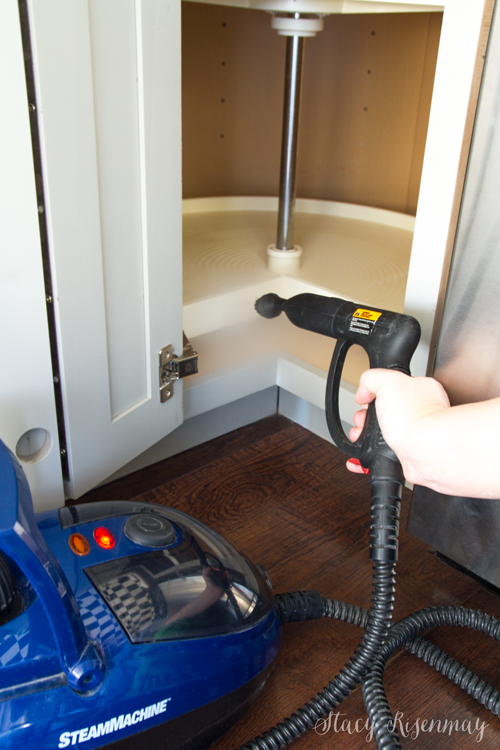 This steam cleaner would be a much needed tool to getting jobs done faster! My linen closet could use a good decluttering. I need to declutter my living room bookcase. I have an open floor plan and a tiny kitchen. The problem area is a set of shelves that goes all the way across one wall and includes kitchen storage items, the printer and paper, some craft items, etc. It’s just become a dumping ground. This was actually my promise to myself this year……stop buying things I don’t truly need and declutter and clean what we already own. It really does cause stress when there is clutter. We are working on a big whole house decluttering project right now. It feels so good to get load after load out of the house! I have come up with a very easy way to line drawers. And the liners are removeable for ease of cleaning! The tutorial for that is on my blog. I have a steam cleaner, but for some reason had not thought to use it on some of the difficult to clean areas in the kitchen. Thanks for the tip! I need to declutter pretty much every aspect of my life! But the garage should probably top the list. My guest bedroom because we basically throw everything in there to ‘finish’ for another time and that another time never comes around. I would so LOVE to win this, I need it to clean my house before the weather gets nice and I am outside all the time. Thanks for having the contest. I have far too much paper and mail that got stuffed into bags and put in the basement. It’s tedious, messy and time consuming and so far all I’ve done is bring it back upstairs but haven’t started sorting yet. Maybe this week I’ll get on it. I’ve been hitting up drawers and closets a little at a time which is proving to work well as it focuses my efforts a little more. I’m easily distracted! I need to declutter my pantry and the closet under the stairs. I look forward to having a tool to help me clean these places out … as well as the rest of my home. My silverware drawer looks identical to yours with the clutter and gunk underneath. That’s something I tend to put off or really just forget that it’s there since we just open drawer to take silverware out and don’t even bother looking. I would love to use the steam machine on that! I need to declutter our toys and our closets! And our craft area and garage. Ok, I may need to declutter the whole house, but those are the biggest areas that need it. well it disappeared while i was writing. i am using a very recent movet to declutter and remove anything not loved. Thanks for the chance to win this great tool! My kitchen and stove also need a deep cleaning. That’s really cute contact paper! I love idea of using a steamer to clean in the kitchen. My hall closets are stuffed to the mask. That is going to be part of my spring cleaning. Cool machine! I could you it in multiple spots throughout our home but I’m thinking the kitchen would be a great place to start! Thanks for the opportunity! ? With the extra cold weather we’ve had this year in Texas, I’ve been determined to declutter my bathroom and kitchen. These two areas are top on my list. Having this steam machine would be a difference maker on my slate stone floors! I’m in the process of decluttering family history items that I have already saved electronically. It requires me to take a second look at most items. Too time consuming. If I had handled each item correctly, I wouldn’t be doing this now..
First, I love tge idea of starting in just one room and decluttering/clean everything in that room before moving on to the next sace. This giveaway is fabulous, and I would lve to own one. 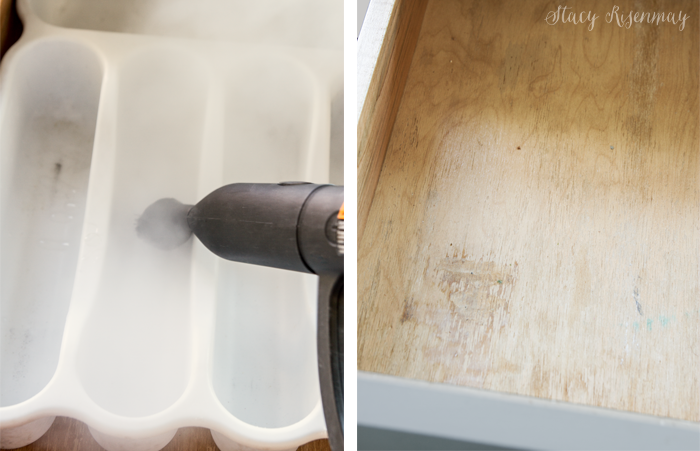 What a great idea to use the Steam Machine to clean the grooves of the lazy Susan. I just downsized and need to de clutter all the extra “stuff” I don’t have room for anymore! I would love this tool! Just finished decluttering my sewing room, but could’ve used the steamer on drawers. My next room is the laundry room, and would love to “have at it” with the steamer! Everything! 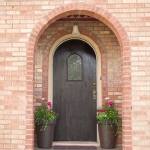 My garage and basement are my biggest challenges. I need to declutter my kitchen, pantry, and one bathroom closet BADLY. Oh, and underneath bathroom cabinets! Seems like I do this constantly only for it to need to be done again. I’m the same way – I prefer to deep clean when I’m cooped up in the winter so I can play outside when the weather is nice. Looks like this machine would make cleaning so much easier! And with the allergies in this household chemical free is perfect! I need to declutter my craft area! It’s too cluttered to do any crafting! Everything! Really my bedroom needs a good deep cleaning! Decluttering has been all purging, we down sized. Lots donated to good charities. When the kitchen was empty at the old house a steam cleaner. I definitely need to declutter a guest room and closet. Still haven’t been able to get a hand on it since we moved in a year ago. Pretty neat little SteamMachine, just in time for spring cleaning!! My kitchen needs some purging and organizing. Love that shelf paper. Thanks for the chance to win a SteamMachine! Neat little SteamMachine! We just moved in 6 months ago, but with daughter moving in 2 months, really need to declutter eveything, it’s time to Spring Clean! I need to declutter everywhere! Deep cleaning for me will start the end of Feb. Would love to win this to help me deep clean the many crevies that need cleaning, including the 28 Windows I have. Trying to declutter and do a whole house cleaning. Can’t seem to keep the bathroom floors and sink clean. What a help this would be. My car could use a good cleaning – especially the floor mats. These seems like such an awesome device! I could totally use! Well, I lost my precious Nana in 2016 and I have decided to keep her home. The house is cluttered so this could help significantly as I am in the purging/ donating/ going through everything process! It’s also still very fresh and sad that I have to deal with this.. so any help with the process would be amazing! My basement….it’s where everything gets thrown till ‘i get around to it…’. I’m planning on moving soon so I really need to declutter my whole home. I’ve always wanted to try a steam cleaner. Thanks for the giveaway! I need to declutter my office and the garage! Yikes! This machine looks amazing! We will be trying to sell our house in the spring – it is just too big and we are just too old to keep up with the up keep. This would help us tremendously. Thanks for offering. Oh my goodness! My entire house needs decluttering!! I’ve been moving very slowly with it but I need a big push if we are going to have a sale this summer for vacation funds! I need to declutter my kitchen and garage. I have so many friends who are getting in the minimalist wagon and I think I need to also. Sometimes I walk into a room and have an anxiety attack… Okay, it’s my daughter’s room ?… But if I’m going to make her declutter then I need to be an example. Love steam cleaner. Wish I had it right now. My mama is recovering from c-diff and we are trying to keep everything germ free. My sister, my mom and I are all Miss Cleans so this is a great tool to add to our arsenal. Thanks for the opportunity to enter this contest. .
Ha! My sewing room is about to get a make over! I just learned how to “fold” all my fabric so it will look pretty. Now I just have to pull everything out, CLEAN it, and put it all back together on my new beautiful wood shelves! Yay! No more plastic bins!!! So, yeah, I am ready to catch for the decluttering bug everyone else has! I would love this for my grout in the kitchen, it definitely needs a good scrubbing. I really need to declutter my pantry and the coat closet in my foyer! We are in the middle of moving the house around so I’m de-cluttering as I go! It’s a mess but it has to be done! We have so many areas of our home that need decluttered. Our Kitchen and Closets being the top 2! It is always helpful to find tips to declutter and get organized. Saves a lot of time for us! I need to tackle our pantry! It so needs to be deep cleaned!!! There us so much de-cluttering to do in this house. I live with a “collector” of too many things! Then I’m too beat to clean. This steam machine is just such a labor saver, lung saver too. 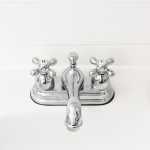 No bleach to disinfect–let the steam do it. No heavy duty harsh cleaners, let the steam do it. Kinda like a bowl of water cleans the microwave so you just have to wipe it out– but steam on steroids so you can clean the bathroom with steam .I’d love one!! I am cleaning out my closet this weekend and I’m hoping to have many bags of give away items. I’d love to have a SteamMachine. The Steam Machine would certainly motivate me to declutter! I have meaning to declutter my shed, I keep putting if off. But I have thinking about tackling that job in February. 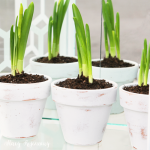 I need to declutter and plan to do so before spring gets here! Using the steam machine would make it so much easier – and cleaner! Thanks so much for the opportunity to win the steamer. My son just moved out for school. His room is so full of dust because he has it full of transformers models & insists on keeping all of the boxes. I have been slowly going from surface to surface trying to get it clean & decluttered. This would be the perfect tool to help get everything cleaned. Thanks for the opportunity to win one!! ?? I need to declutter my entire house! That was my New Year’s Resolution. I had a late start since my mom passed away a couple of weeks ago, but I’m almost done with my kitchen. If nothing happens between today and tomorrow night, I will be 100% finished. What a great feeling! Next I’ll move onto the downstairs bathroom. I am in the process of decluttering a few rooms and steam cleaning would be an ideal next step. 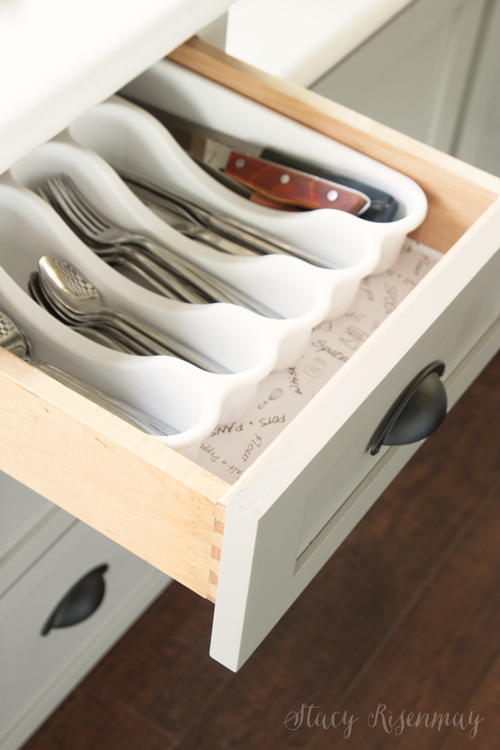 I need to declutter my kitchen cabinets and drawers. When we moved into our house I had 2 cupboards with extra space in them. Over the years they have filled up with clutter and need to be organized. My pantry needs a serious cleanout. I need to declutter the whole house! But the worse is probably our grandsons bedroom! I need to declutter my whole house! I need to declutter my kitchen and bathroom cabinets. I have started decluttering the closets in my home but still have more to do. I am like you as in when the weather gets nice, I have trouble getting motivated to clean inside. Actually we’re living out of boxes right now in my parents house as our new home is being built! That being said we had to pack pretty quickly, and I didn’t get to do much de-cluttering. my pantry could use a complete overhaul. Thanks for this opportunity. The declutter has begun! As well as downsizing in order to move in the Fall! Decluttering my pantry today. Been thinking about ordering one of these steamers. Have read other posts on now great it is for cleaning bathrooms. 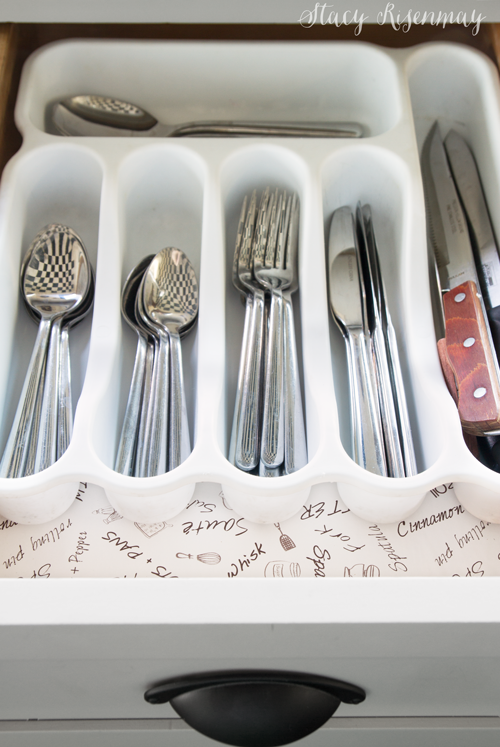 If I could start with one tiny job….. like cleaning the silverware organizer… I could see progress!!! Need to clean house! Two dogs and a cat add to the mess. I rrrrrreally need to declutter the kids’ play areas and weed out some outgrown or unloved toys! I’m in the midst of a major declutter project. I’m trying to be more mindful of what we bring in our home and to get rid of things we don’t use often (or at all). Thanks for the great giveaway! I’d love to have a steamer to help with cleaning. needed clothes to send to Thred Up. Then I can move to our living room! Currently working on decluttering the entire house to welcome and make room for our second baby this summer. Taking it one area at a time and trying to keep all of the cleaning chemical free. How I need..really need this. Over the weekend we opened up my parents home/estate..To our shock and horror..mice have been nesting! Cold winter bright the in. Not only are we throwing out a lot..you can call it a forced declutter..we have lost many treasures..heirlooms. And, everything in three rooms will need a massive and thorough deep clean..saninitized.. This home right steam woukd helps so much. I would use the stuffing out of this machine! I need to de clutter my garage! Right now, it feels like I need to declutter the whole house! Slowly working through rooms/areas in small batches so I can do a thorough job and not have to repeat. 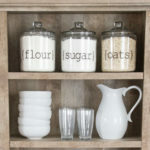 I need to declutter the kitchen cabinets and pantry! And I totally know what you mean about mysterious crumbs in the silverware drawer!! Why oh why? And where do they come from? I need to declutter my whole house. I kid you not. We down sized from 2300 sqft, to 1400 & it’s brutal. We are still in boxes after 2 1/2 years. Plus, we dded two dogs, so I am sure you can imagine the clutter and the hair. lol. I need to declutter my laundry room! I really need this because a friend barfed in my car on NYE and there’s just no getting it clean enough! i really don’t know what i need to declutter my house. lots of time i guess. and help. since moving in to this house a year ago i have not unpacked much because i am planning on so much renovation and updating but that is on hold due to health issues. foot surgery among them. so i guess the best answer is simply time. I need so terribly badly to clean organize & d eclutter my basement & garage! 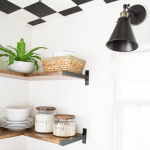 As a f3llow DIYer and decorating fanatic, i am sure u can appreciate how cluttered these areas of my home are, and HOW MUCH this homeright steamer would help in both of these tasks, as these are both concrete floored spaces in my home!! Thanks for the awesome tips!! Definitely my office and our pantry. They’re both out of control!!!!! I have always wanted a steam machine but haven’t bought one. I need to declutter both of the bathrooms and completely clean them from top to bottom. I enjoy your blog. I would just like to do a really great spring cleaning. A steam cleaner would be awesome to help. A bit of a pact rat so the entire house pretty much needs decluttering. I am more interested in the cleaning part though. Have heard that steamers are great for cleaning ovens and cleaning them manually is painful. My basement is currently the black hole of lost and unwanted items, it definetely needs decluttered. Have a great day! Such perfect timing on this post, because I’ve been working on decluttering & deep cleaning our home! What do I need to declutter – everything, really! I’ve been slowly purging unneeded items and creating efficient storage spaces so that the changes I make will be sustainable long term. Right now I’d like to do more of this in our living room. 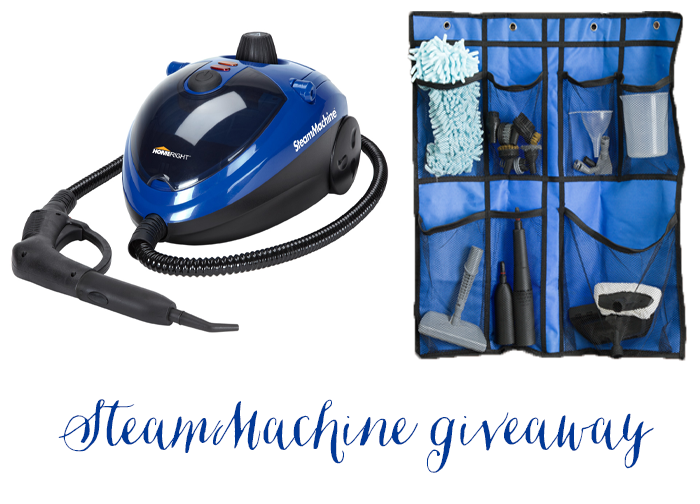 Such an incredible giveaway – I would LOVE a SteamMachine! :D Thank you so much for the opportunity! I need to declutter my desk. It is entirely covered with papers that need to be filed and stuff that needs to be thrown out or donated! I need to declutter my bathroom shelves. I need to declutter the whole house! With being sick, having animals, and young kids things have gotten crazy!! !